I have a confession to make. I am a Virtual SAN junkie. From the performance, to the expandability, to the simplicity, it’s an amazing product. The whole concept makes me wonder why the big storage players didn’t come up with the idea first. Looking forward, the future forVSAN is very bright. This is a massive development and I think it will have wider reach than NSX. It’s so easy to get up and running, that a business of any size could spin it up with little effort. Just don’t forget to validate against the HCL. Now, if you are happy with that and don’t really intend to do much with it then click away now, but if you want to understand more about the technology you are running then Duncan Epping and Cormac Hogans book Essential Virtual SAN is one of the best resources you can sink your money into. Before we carry on, one thing to note is that this book is written around VSAN 1.0. While VSAN 6.1 is out it’s not 6 versions further on but more like 1 full release and 1 point release further on. VMware changed the version numbers to reflect the vSphere versions. So that said, this book isn’t obsolete. Far from it. The new versions really only build on what is already an amazing platform. It is still completely relevant, just missing some new goodies, like stretched clustering and info about the updated file system. For all the updated info have a crawl through Cormac’s blog and the VMware Technical Papers. I’ve ready a couple of Duncan’s other books, the vSphere 5.1 Clustering Deep dive written with Frank Denneman for example,and found them to be very easy to read. Often a book aimed at techies can be very dry, which makes then a struggle. Cormac is Mr VMware Storage and his blog, read by many people, is always informative and good to read. Essential Virtual SAN on the other hand reads well. 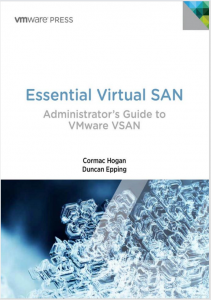 The sections are well thought out and the book takes you from introducing VSAN all the way through to using the vSphere ruby console to look in real detail at what the individual disks are doing. The authors do state that this is not a starters guide, while they are right, I found this book to be more than enough for both beginners and the more experienced to really find useful. 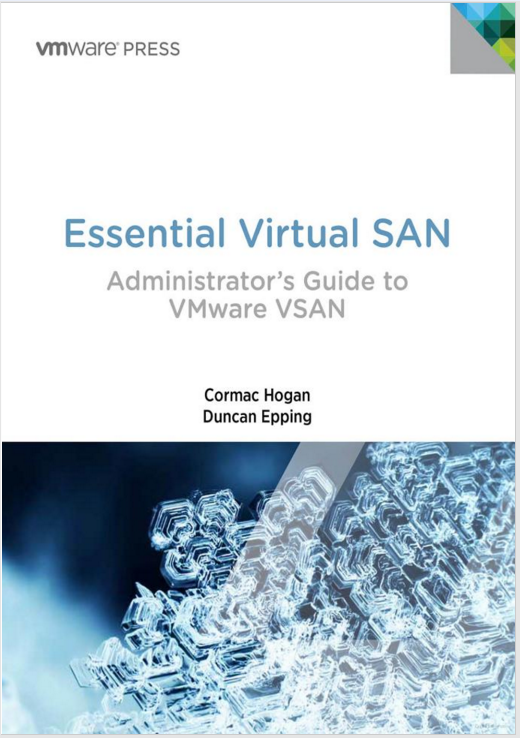 Duncan and Cormac’s enthusiasm for VSAN really comes through in this book. Obvious, I know, when you look at their blogs, but it does feel like this is more than a 9-5 for them. At the office we have recently deployed VSAN. This went through the usual steps of putting it in engineering, running a successful POC and finally getting senior management buy in to roll it out. This book was a huge help in helping me boost my knowledge and fielding any concerns raised by the business. I did attend the VSAN deploy and manage course, this book is better. The future for VSAN is bright and, to me it’s clear that this should be on your roadmap, if it isn’t already. < Previous Graylog – Dashboard Creation.